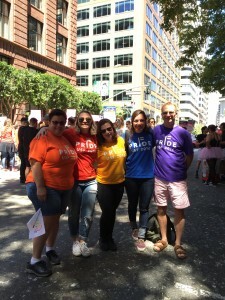 Last Sunday my family and I had the opportunity to march in San Francisco’s Pride Parade with members and supporters of the university’s LGBTQ (Lesbian, Gay, Bisexual, Transgender, and Questioning) Caucus. It was a beautiful summer day in San Francisco, which means, I am finding out as a new resident, it was sunny and about 70 degrees on Market Street in the city. There were over 200 participants in our group, which included faculty, staff, and students; young and old(er); and members of the LGBT community and those who are supporters of it. Everyone appeared to be having a wonderful time, and it was great to see all the enthusiastic supporters of the university along the parade route. San Francisco has long been known as being welcoming to the LGBTQ community, and this was demonstrated throughout the entire parade route. My wife and I first participated in a Pride Parade 20 years ago in Boston, when we were pushing our then 2-year old daughter in a stroller. We were pleased to have that same daughter, who is now a recent college graduate, marching with us along with two of her friends visiting from Boston. 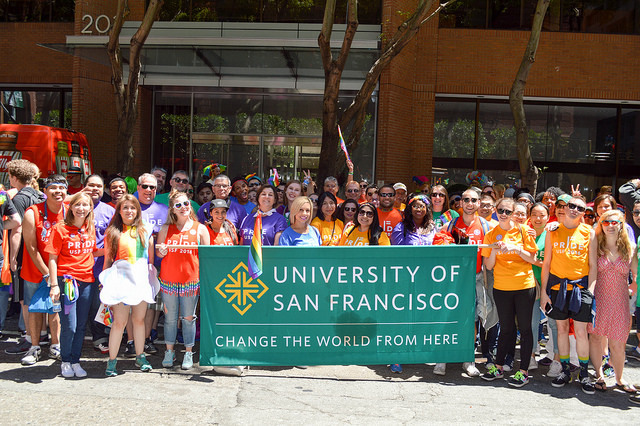 Like the city in which we are located, USF is a welcoming place for LGBT students and employees. Our Gender and Sexuality Center provides programs to help students explore their gender and sexual orientation-based identities, and support them as they navigate their lives at USF. We provide scholarship and fellowship support for students who are interested in working with LGBT populations. And we have a number of faculty who do research and teach on LGBT issues, such as a sociology course and a course on LGBT cinema. USF is not the only Jesuit Catholic institution that supports its LGBT students and staff members. The Conference on Diversity and Equity of the Association of Jesuit Colleges and Universities, the umbrella group for the 28 Jesuit higher education institutions around the country, is actively engaged in working with members institutions on LGBT issues. It was heartening to hear that the same day that the San Francisco Pride Parade was taking place, Pope Francis reiterated his earlier comment that “homosexuals should not be discriminated against,” and that even further, the Roman Catholic Church should apologize for past treatment of gays. As one who holds a leadership position in a Jesuit institution, though not a Catholic myself, it was affirming to hear Pope Francis continue to move the church in the direction of being more supportive of the LGBT community. I will look forward to participating in future Pride Parades with the LGBTQ Caucus and demonstrating the university’s support for all of our students and staff members.